Hey, Do you see the moon tonite. Isn’t it beautiful? So what are these stars nearby? Or are they planets? The whole week it had been raining. But now, though the sporadic showers we can have a beautiful sky tonight. Tonight at 11:00 p.m ( local Mauritian Time), in our sky the moon which is in its waxing gibbous phase, is between three stars. The star above the moon is Procyon. Procyon is the brightest star in the constellation Canis Minor (the small Dog). 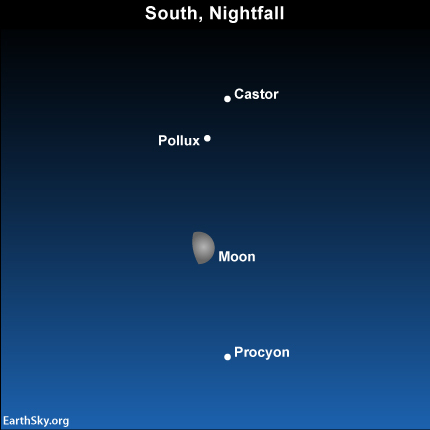 And below the moon we have two stars Castor and Pollux. These two stars are in the constellation Gemini (the Twins). Towards the West, you can have a look at Sirius, the brightest star in our skies. Sirius is in the constellation Canis Major (the Big Dog). And towards North West you would have to raise your head to see Mars , a bright looking yellow star in the constellation Leo. Though as I said Mars looks like a star but is not. It’s a planet. So have a look before it starts raining cats and dogs again. Did you know that in the Southern Hemisphere, the moon passes between the Gemini stars and Procyon once a month? And people living in the Northern Hemisphere will see the moon, Gemini stars, and Procyon in their southern evening sky. They’ll see the scene “upside down,” with Procyon shining below the moon, and Castor and Pollux above the moon? You still don’t understand? 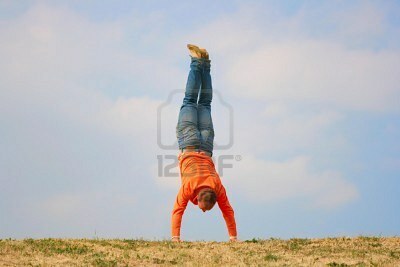 Ok, just do the up-stand position in front of the night sky, you would get the “upside down” scene. Looking up and finding patterns in the stars is a pastime that’s as old as humanity. The constellations are rich with mythology that has been passed on for millennia. The name for these unofficial constellations is “asterism.” Like constellations, asterisms have a long history. Some are regional, (this particular asterism list is from Germany) while others are universally recognized. Some are ancient, while others are more modern. If you enjoy stargazing, you may even have a few of your own personal asterisms. So go and be creative in the night sky and have fun. If you are willing to find these asterisms, my advice would be to use Stellarium, if you still haven’t downloaded it, go grab it for free. you just have to type in the stars names in the Search field, for example: “delta Ori”,”epsilon Ori” and “zeta Ori”. And then you could be able to identify the asterism”the belt of Orion”. Pretty easy, huh! Located in the constellation Cancer. It is an open star cluster, which is also called Praesepe or M44 and faintly visible to the naked eye. With the stars gamma Can and delta Can it forms another asterisms called the Asses and the Manger. is being formed by the stars delta Ori, epsilon Ori and zeta Ori; in Latin Amerika it is called the “Three Marys”. is being built by the four stars alpha UMa, beta UMa, gamma UMa and delta UMa. most famous asterism. Formed by the following Stars of the Great Bear alpha UMa, beta UMa, gamma UMa, delta UMa, epsilon UMa, zeta UMa and eta UMa, it is often called “Wain” (Wagon) or “Charles’s Wain” because of its resemblance with it when the Dipper handle is thought to be the wagon tongue. the western fish; the circlet is formed by gamma Psc, b Psc, theta Psc, iota Psc, 19 Psc, lambda Psc and kappa Psc. Actually this is not a true asterism, but a dark patch on the Milky Way, in the constellation Crux. By the African Bushmen it was called “Old Bag”. The following five members of the constallation Sagittarius can be interpreted as an inverted dipper in the Milky Way: zeta Sgr, tau Sgr, sigma Sgr, phi Sgr and lambda Sgr. This asterism is also known as The Teapot. the stars eta Per, gamma Per, alpha Per, delta Per, epsilon Per and zeta Per forming an arc. theta Ori and iota Ori; between them the famous Orion Nebula (M42) is located. also on Orion; the belt stars (delta Ori, epsilon Ori and zeta Ori), the sword and eta Ori build up this asterism. The sword forms the handle of the diamond-shaped mirror. 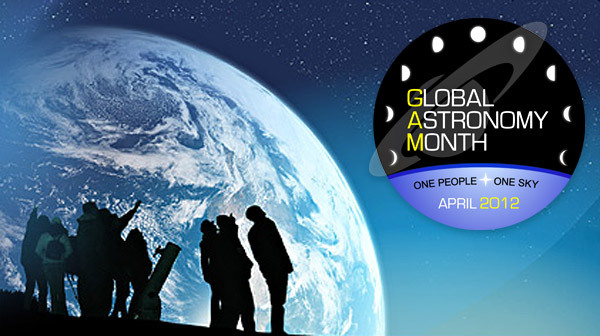 AWB is planning a rich schedule of programs and events for Global Astronomy Month 2012 (GAM2012), all designed to inform and inspire the public throughout the world. Below is a sampling of some major events listed by date but there is much more to come soon. For more information on each program, click on the highlighted links. ALPHA STAR : proper name of the alpha star. ©Cosmobrain.com 2001 – All Rights Reserved. 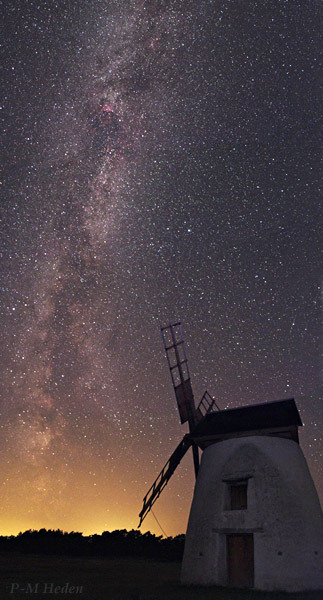 Submitted photographs must be created in the “TWAN style” — showing both the Earth and the sky — by combining elements of the night sky (e.g., stars, planets, the Moon or celestial events) set against the backdrop of a beautiful, historic, or notable location or landmark. This style of photography is called “landscape astrophotography”. This is similar to general “Nightscape Photography” but with more attention to the sky, astronomical perspectives, and celestial phenomena. Winners this year will be announced by the end of April, to celebrate the end of GAM 2012. A wide range of prizes for 1st, 2nd, and 3rd place in both categories will be awarded. The prizes could include (as last years) telescope and camera mounts, telescopes, binoculars, astrophotography accessories, filters and gift certificates. 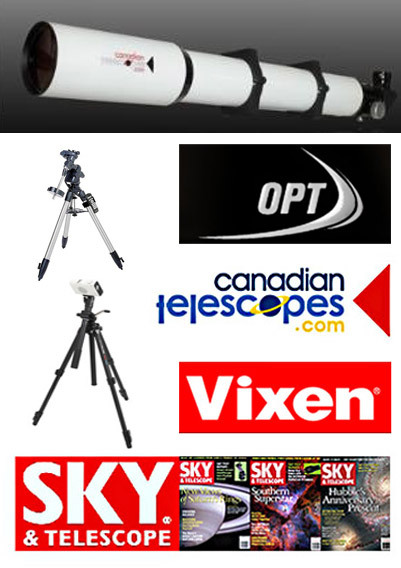 The contest organizers wish to gratefully acknowledge the assistance of Oceanside Photo & Telescope (OPT), Canadian Telescopes, Vixen Optics, and Sky&Telescope magazine in obtaining some of the prizes. More information about the prizes and supporting companies will appear on this page soon. – Only photographs in digital format may be submitted. Photographs taken using film must be digitized for submission. Scanned prints may also be submitted. – All entries must be accompanied by a short caption. – Photographs must be submitted as high-quality JPEG files (level 10–12). The preferred color spaces are Adobe RGB (1998) and sRGB IEC61966-2.1. Contestants are strongly encouraged to use color management and to use one of these color spaces for their submitted images. – Submitted photographs should be no larger than 1600 pixels across in their wide dimension and not smaller than 1200 pixels long. File size should be no larger than 2 Megabytes. Judges might request high-resolution files from finalists for final evaluation. – No more than 5 photographs may be submitted per person. If the contestant submits more images, only 5 of them will be randomly selected. So extra submissions might result in removing your better images. – Each contestant will be registered through the submission page and can edit profile and content, and add or remove their submitted images until the contest deadline. – The contest highlights the recent efforts of landscape astrophotogtraphy. Images must be taken since January 1, 2011. Photographs taken before January 1, 2011 are ineligible. – Photographs must be submitted from April 1 to the Earth Day, April 22, 2012. Winners will be announced by April 30, 2012. – Entries must combine elements of both Earth and Night Sky—i.e., landscape astrophotography. 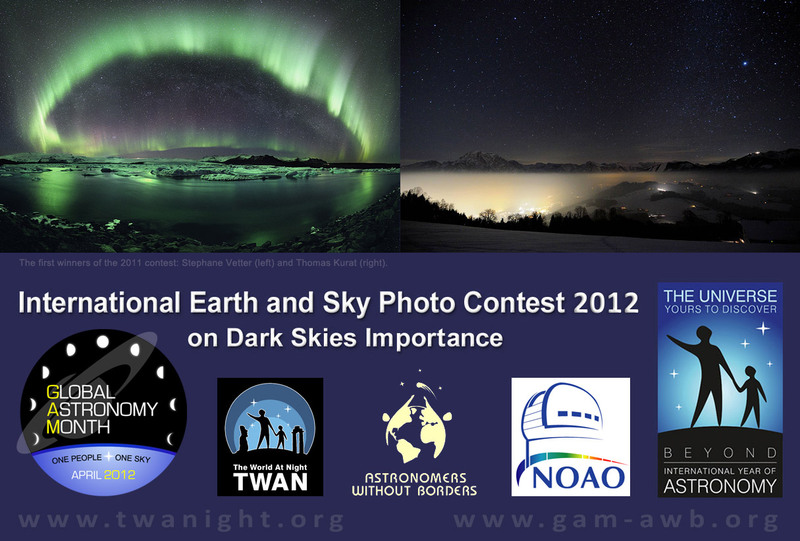 – Entries must follow the contest theme of dark skies importance with displaying the beauties of starry skies or the problem of increasing light pollution. 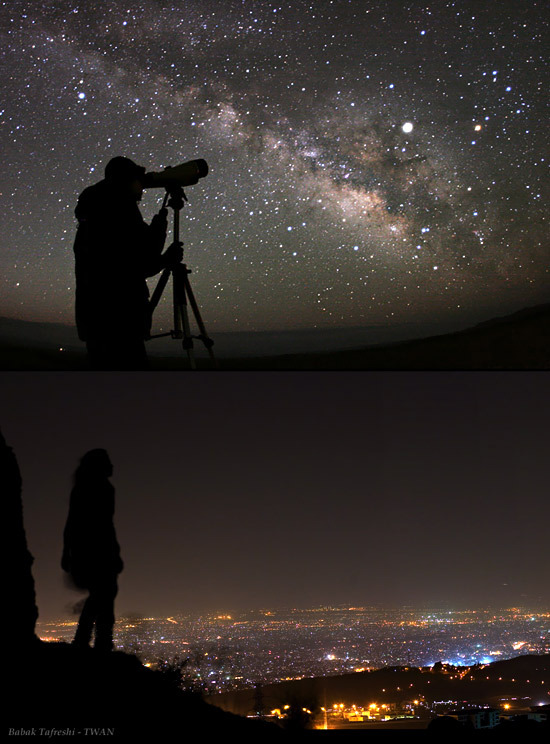 – A pair or a series of comparing images to display the difference between dark and light polluted sky can be submitted as one entry. The comparing images can make strong public impression on importance of dark skies. See a TWAN example of such images here. – Photographs may be taken through a telescope, but must combine Earth and Sky composed in the same photograph. Photographs taken through a telescope that show only the sky are ineligible. – Minor burning, dodging, color and exposure correction is acceptable. Cropping is acceptable. Fish-eye lenses are acceptable. High dynamic range images and stitched panoramas are acceptable only if the combined parts are taken at approximately the same time and with the same setting. Digital composition of a series of photographs taken successively at the same location with the same lens pointed in the same direction, for example to create a digital star trail image, is acceptable. Any other changes to the original photograph not mentioned here are not acceptable, and will render the submitted photo ineligible for a prize. – Composite images made by combining images taken at different locations, different times, or using different lenses are ineligible. – The submitted photo must be the original work of the contest entrant. The entrant must be the copyright holder of the submitted photo. – The Photographer retains complete copyright, but agrees to have his/her photograph published on TWAN website and on other online media together with the report about the contest results. – Model releases will be required for all winning photographs that contain a person in the image. – Submitted photographs must not contain provocative, defamatory, sexually explicit or otherwise objectionable content. Entries may only be submitted on-line. Submitted photographs will be judged by a panel of TWAN photographers based on creativity, relevance to the topic, and aesthetic beauty. Contest prizes will be announced later this month. You can contact us for any further inquiry related to the contest. Let’s capture immemorable moments….Give me a shout if you’re participating. The Moon occasionally occults – or covers – stars and/or planets from our point of view, on it’s journey around the Earth. This week, on the night of the 1st into the morning of the 2nd, observers in northern sections of North America over towards Greenland may be able to spot this event. If you are not sure if you will be able to see it, download the software Stellarium and input your location and local time. For some, the Moon may have set by the time the occultation occurs; for those that can see the Moon and star but not the Moon covering it, watch how fast the Moon moves by the star through a telescope, if possible. Also this week: Mars reaches opposition on the 3rd, and will get smaller as the Earth revolves faster around the Sun. Nearby to the Red Planet are several brighter Messier galaxies in Leo the Lion, worth checking out in medium or larger telescopes. Also discussed: Where to spot Venus, Jupiter, Mercury and Saturn this week. This week, the two brightest planets in the night sky, Jupiter and Venus, get closer each day until they reach conjunction early next week. Watch this planetary pile-up over the next few days, and later in the week, spot both planets in the same field of view with binoculars. As an added bonus, the speedy Mercury reaches it’s highest point above the horizon early in the week, making it an easy spot below the two brighter planets at evening twilight. Also this week: The Moon moves by Mars early in the week, and sidles up to Saturn by Saturday; look for this to occur around midnight towards the south. See the video for details. The galaxies M95, M96 and M105 in Leo are far enough away from bright, easy-to-find stars that they can be a bit of a challenge to find. But this week, Mars literally passes right through their midst, and at magnitude -1 (brighter than most every star in the sky), it makes it a cinch to find them. Also, Jupiter and Venus are dancing past each other in the western, evening sky, unmistakably bright in some dimmer constellations. 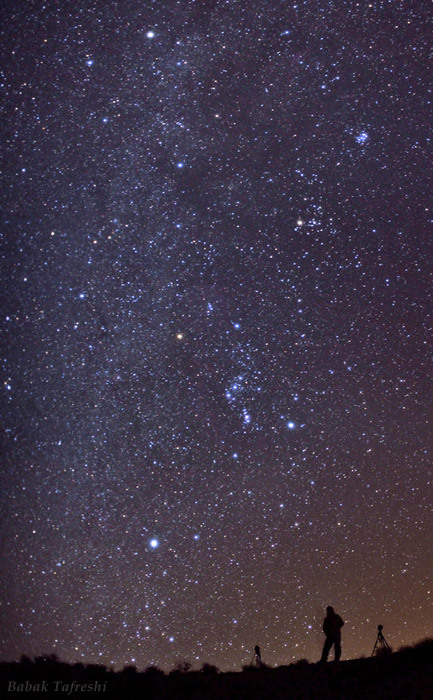 Look a bit towards the north though, and spot the constellation Perseus, with it’s treasure trove of open clusters visible in binoculars and small telescopes. And last but not least, Saturn has easily cleared the horizon well before midnight, so not is an ideal time to set your sights on the ringed planet. The Virgo galaxy cluster is a “must-see” area of sky for any amateur astronomer looking to conduct a Messier marathon, which are popular to attempt around this time of year. “Eyes on the Sky” points towards the “jump off point” to find several of these galaxies. Swinging northward, Comet Garradd is still slowly making its way through our solar system, cruising past the pointer stars of the Big Dipper this week. It is an easier target in a small, wide-field telescope, but can be spotted with binoculars in moderately light polluted areas with careful scanning. 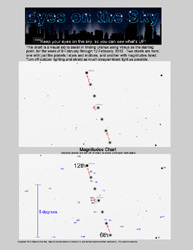 Download and print this star chart from Sky and Telescope magazine to help you find the comet this week. Though the conjunction of Venus and Jupiter is several weeks past, there will still plenty of fantastic views to in the western and southwestern evening sky this week thanks to those planets, the Moon and some nearby stars and open clusters. And looking towards the north, an oft-overlooked section of the Big Bear gets some attention this week, offering up some interesting insights into stellar evolution, colors and distance as the “Leaps” lead to luminous lights in the sky. The Moon joins Venus in the sky, then Venus joins the Pleiades, and the whole sky looks fantastic by the 28th. Then turn northeast/overhead to the Big Bear, Ursa Major, where 3 sets of stars make tracks in the sky – and not from bearprints, either! The lovely colors of Tania Borealis and Tania Australis are the highlight this week – easily visible in binoculars everywhere, and naked eye from most areas. Also, Mars continues retrograding in Leo towards Regulus and Saturn sidles up to Spica. The sky is like a grid with lots of scattered dots. Joined together they may take many a lot of forms, depending on the whims of the sky gazer. But with these groupings known as Constellations they have helped us a lot to discover the sky. Before the advent of the T.V, internet or the recent social medias there was a time where people used to distract themselves by observing the sky. The sky used to marvel their souls as it was a not a stagnant beauty but the moving of the stars on the celestial plane would be their night show. After having gone through a day of accomplishment like “yeah, I conquered Rome to-day”, looking to the sky, with all its wonders would humble their beings. We should be full of chagrin that today we are not able to appreciate and contemplate on the night sky in our urban settings. Artificial lights, though beautifying our space have barred our view of the beautiful night sky. Urbanization has given us a great wonder of man-made lighting everywhere, making our nights to become days where never ending work (24/7) has become our norm. But……there was a time, when people had “time” to look and observe the sky. So, they grouped the stars into constellations. Where did these constellations originate? The Greeks were creative. In fact, the constellations even today are named after the mythical beings, shapes or creatures they honored or resembled in their minds. For example, the Orion constellation takes the form of a man wielding a club and wearing a belt and a sheath. Taurus resembles a bull’s head. And Scorpio is the Scorpion which is going to harm the man in the Orion’s constellation. We will back with the creative stories of the Greeks in the constellations category. The constellations were helpful for remembering the stars, but at that time where people having loads of time in their hands would attribute the sky to several other purposes. It is common story in astronomy that farmers of the past would know about the movement of the stars and constellations in order when to sow their crops and when to harvest. Story tellers among the Greeks would use these constellations to relate about the exploits of their Gods. 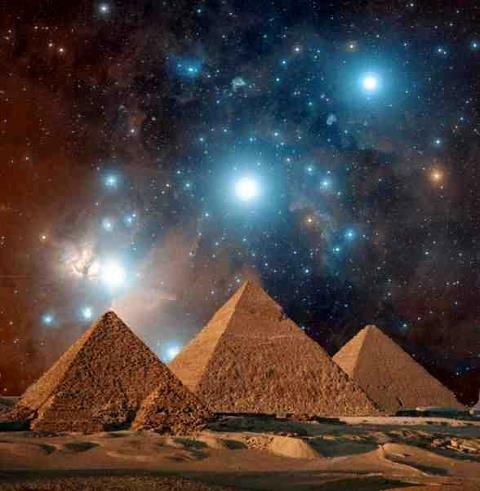 And strange enough, the Egyptians had aligned their pyramids in Giza to the Orion’s belt. The three stars in the belt as Alnitak, Alnilam and Mintaka. The Arabs were the ones who preserved the astronomical science and augmented in the science so that the generations to come may take benefit from this extraordinary science. It is so interesting to know that the constellations were given Arabic names and even loads of stars got their names too. For example, In the Orion’s constellation Betelgeuse was previously yad-al-jawzaa, which later in my opinion became bad-al-jawzaa to Betelgeuse. Whereas Saiph the star, the bright star adjacent to Rigel, means The Sword. And Alnitak, Alnilam and Mintaka are Arabic too which are still called the same. Alnitak means ‘the girdle’ Alnilam, means ‘the string of pearls and Mintaka means ‘the belt’. Then In the early twentienth century the constellations were put to an order and to the previously classical constellations other constellations were added up by the International astronomical Union up to 88 constellations which is still in use to date. Thus the sky is now divided in these constellations, to help humanity in observing them. Obviously, these stars do not have boundaries or lines to join them when we look at them in the sky, but with the game of joining the dots, we are able to make up the lines and identify the constellations. Further division was given to the constellations by forming patterns known as Asterisms. Well-known “constellations” such as the Big Dipper, Little Dipper, the Teapot, the Northern Cross, and the Summer Triangle are not among the official list. Some, like the Dippers and the Teapot, are actually parts of other constellations (the Big Dipper, or the great bear is part of Ursa Major, the Little Dipper is part of Ursa Minor, and the Teapot is part of Sagittarius). Others, like the Summer Triangle and Winter Hexagon, include stars from several neighboring constellations. These asterisms help us to identify the brighter stars in the constellations. If you enjoy stargazing, you may even have a few of your own personal asterisms, like I did on my entry to stargazing. So now I have to learn 88 constellations to understand this Astronomy? Ahhh…..Kinda yes. If you want to be familiar with the sky then you have to know the stars and the constellations. But it is a marvelous, jaw- dropping adventure which you will never regret. And learning along is the great thing. Yeah, but still I have to learn 88 constellations? Rome was not conquered in one day. Learning the sky can be done step by step. You learn it by loving it. 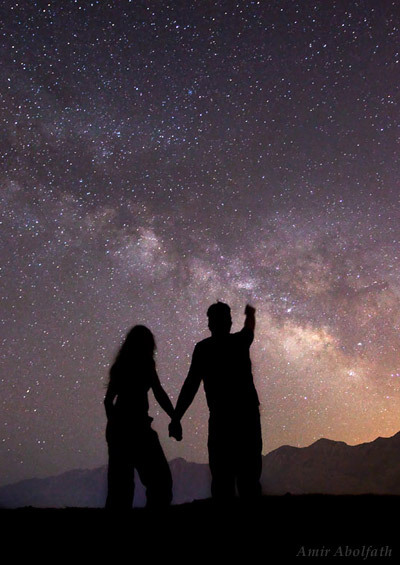 No rush for a certificate, no rush for schooling, just you and the stars. Finding Betelgeuse in Orion would be pretty easy. But also knowing that it is classified as a red supergiant, Betelgeuse is one of the largest and most luminous stars known. 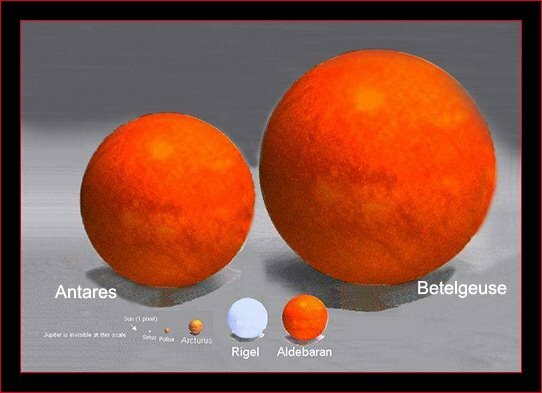 In terms of mass, Betelgeuse is thought to be about 15 times the mass of the sun, but 600 times wider and more than 200 million times its volume! Though it looks tiny but it is not what you are thinking……. Isn’t the study of stars cool? Found our star, the sun? Stay tuned, there is more to come. Find the 6, easy to spot, naked eye stars of the Winter Circle (or Winter Hexagon), as well as Collinder 70 and Messier 41 within that area. A tour of several bright stars in the area includes close-ups of each star to get a sense of their relative size, and later the ecliptic is examined thanks to the alignment of Venus, Jupiter and the Moon. Uranus is a 5.9 magnitude object in the sky; barely visible naked eye from very dark locations, and visible with binoculars from most light polluted areas. So how to find it among the other 5th, 6th and 7th magnitude objects in the area? Use a brighter object to guide the way! On our journey around the Sun, the other planets’ positions change relative to our own, and this week, we see Venus “passing by” Uranus in the night sky. As many amateurs have never even seen Uranus through optical instruments, this is a great week to try and spot our solar system’s 7th planet. Download the PDF chart here (4.1 MB) to help you spot Uranus this week. Also in the sky: Mars and the Moon make a magnificent pair in the sky this week, and as Mars is close to opposition, now is a good time to view not only the Red Planet, but some Messier galaxies that are nearby as well – thought it is better to spot them in a week or so, after the Moon has revolved further east in the sky. The Globe at Night initiative enlists the help of amateur astronomers everywhere across the globe to submit what the sky looks like in their area with respect to how light pollution affects their visible sky. This week’s video focuses on that effort, and explains how to easily find the constellations used by Globe at Night as well as how to submit observations quickly and easily. To learn more about this effort and to submit your observations, visit www.globeatnight.org. See the Moon pass Mercury, Uranus, Venus and Jupiter all throughout this week; the brightest stars of Gemini and M35 are spotlighted as well. Also discussed: Where and when to see Mars and Saturn in the night sky this week. The all-new “Eyes on the Sky” kicks off by focusing on Capella, Auriga, three stellar Messier objects within it, and the Quadrantid meteor shower. Joining the fun is a cameo appearance by none other than Mr. Charles Messier himself! (Did they have film back then? Nah, but this is what makes astronomy fun!) See what’s in the all-new format, as well as what’s ‘up’ in the night sky this week. Mars and the Moon take center stage in this week’s video; Mars has increased in size to about 10 arc seconds across recently, and will reach opposition in early March. So now is a good time to start observing the Red Planet to see what details are possible at this less-than-ideal opposition with it. The Moon is our closest celestial neighbor and offers great detail in a small telescope or binoculars, plus it recently acquired interest from two more spacecraft. Find out all about that and more and see what’s ‘up’! Take a tour through Taurus (Part 1) by visiting Aldebaran and the Hyades, then set your sights on Saturn and it’s moons as the ringed planet reaches sufficient altitude in the sky by early morning to warrant telescopic viewing. Also covered: Where Venus, Jupiter and Mars can be found in the sky this week. Finishing the tour of Taurus, this week’s “Eyes on the Sky” video focuses on how to find and see the Pleiades and M1, the Crab Nebula. Light pollution and light trespass avoidance strategies to enhance viewing of dim celestial objects are discussed. 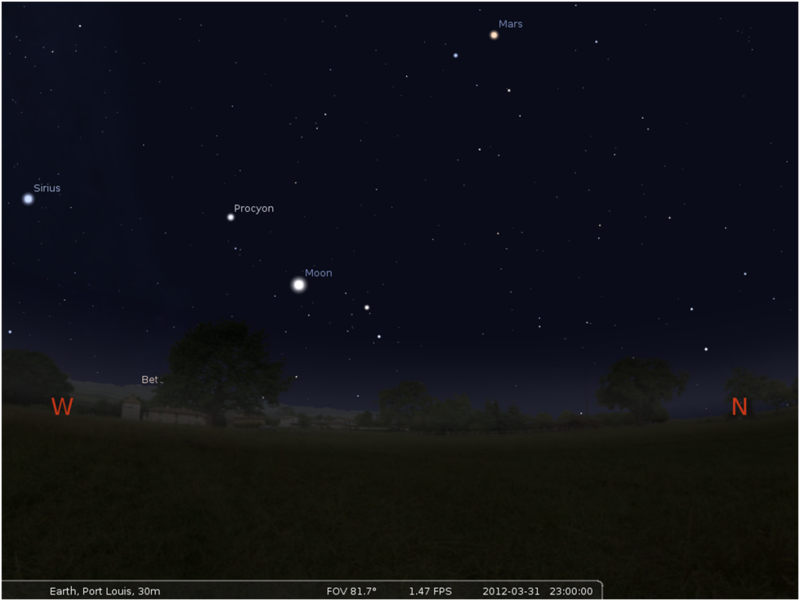 Also highlighted: Jupiter and it’s moons, plus notes on how and where to find Venus, Mars and Saturn this week as well.